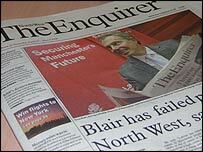 Yesterday saw the launch of the North West Enquirer, the new regional weekly paper. Though its server seems to be having problems at this particular moment, I'm delighted to see that they've put some content online (though not, sadly, the piece I wrote about the Derek Williams exhibition in Preston, which is in the arts section.) Stu at Feeling Listless has a very in-depth post about his thoughts on the new issue, and raises some good points, I think, especially about its lack of listings. What does anyone else think of it? I'm curious.